The world surrounding the G.I. 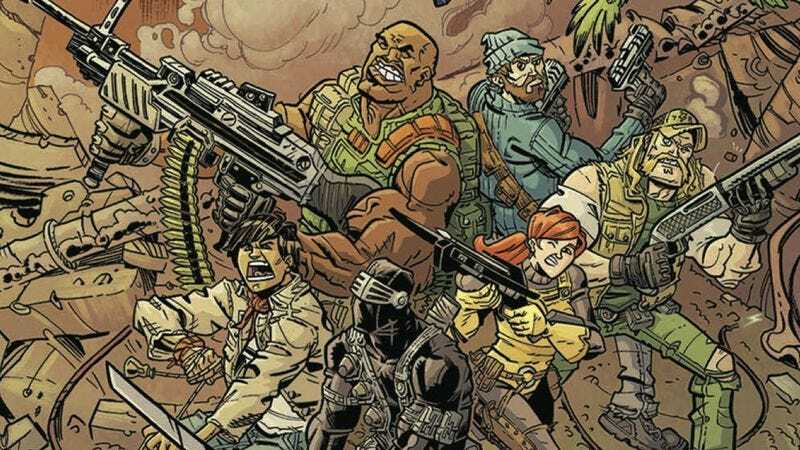 Joes has become increasingly fantastic, with the current Revolution crossover bringing IDW’s Hasbro properties together. And now that giant transforming vehicles and shapeshifting aliens are the team’s big threats, the G.I. Joe comic is moving in a direction that is less concerned with reality. That new direction begins in this week’s Revolution: G.I. Joe one-shot by writer Aubrey Sitterson, artist Giannis Milonogiannis, and colorist Lovern Kindzierski, which sends a small six-person squad on a rescue mission that is especially treacherous because aliens have infiltrated the team. This preview wastes little time getting to the action, and the most exciting thing about this new run is the involvement of Milonogiannis, who has done incredible work with action storytelling and sci-fi world-building on books like Prophet and Old City Blues. The splash page at the start brings forceful energy to the story as the group is torpedoed to shore, and that energy builds as new dangers emerge on land. Sitterson’s character banter adds humor to the proceedings, and Kindzierski’s vivid colors intensify the action beats, especially when Quick Kick starts pummeling the alien in their midst. There are many more pummels to be had when this team launches a new G.I. Joe title next month, but readers can get their first taste of this new era by picking up Revolution: G.I. Joe this week.